Online workers comprise one of the fastest growing segments of our economy. In fact, there are nearly 400,000 writers on Upwork alone, not to mention other virtual marketplaces like Guru.com. This rapid growth is being fueled by many factors, a major cause being convenience for the employer. We all know how much of a headache it can be to hire a full-time employee, particularly in terms of paperwork, multiple interviews, recruiting costs, and risk. Hiring online workers minimizes such issues. In fact, a recent study found that hiring online workers typically takes less than three days total (compared to 24 days for on-premise workers). So if building a team of online writers has so many potential benefits to your organization, what’s the best way to tap into the virtual workforce? Specialize, specialize, specialize. Thanks to the virtual marketplace, you’re now able to match your content creation needs to the skill sets of millions of contractors. Start by identifying the structural needs of your specific content development activities (those that are not adequately covered by your existing staff). General web content, such as products, features and benefits, company-focused information, etc. Blog / blog categories, including content that is educational, timely, news, technical, industry-related, etc. Downloadable content / assets, such as white papers, brochures, case studies, eBooks, or checklists. Email content, like newsletters, product-related mailers, call-to-action blasts, lead nurturing, autoresponders, etc. Social & microblogging content that is aimed at engagement, industry focused, and/or company specific. PR materials, such as press releases or event-related content. Next, it is important to begin identifying specific needs you have in each category. Start by compiling these needs into a matrix that matches your content generation processes to your human resource vacancies. I’ve created a sample matrix that you can use, below. For purposes of this article, let’s imagine that we’ve identified some holes in our blogging team, specifically for a new client in the software industry. The client needs three blog articles written per month: one technical, one about company happenings, and one educational. Here’s what this portion of the matrix looks like after assessing needs. Now that we’ve identified the client’s needs, it’s time to initiate the recruiting process on virtual marketplaces, such as Upwork or Elance. Feedback score: I typically don’t consider hiring anyone with less than four stars. The rare exception to this would be if I identify a new online worker who has not yet established a rating. I say rare because it is risky. Hiring someone with no feedback can be scarier than someone with bad feedback. Hourly rate: I’d expect to pay more for a technical writer than someone who is managing my tweets. It’s simple supply and demand: The more specialized the need, the more you should expect to budget. Tests taken / passed: Often overlooked by virtual employers, I actually view this as an important indicator. If a contractor has taken the time to pass relevant skill tests, it becomes easier to compare your staffing options. For our technical writer, I’d want to make sure my finalists score well on the UpworkoDesk test for technical writing. Number of hours / projects worked: Similar to feedback rating, this helps determine how successful (and, in turn, how skilled) a prospective writer has been in the virtual marketplace. Lots of contracts and projects indicate the contractor is serious and valued. Pre-interview: First, take a look at candidate portfolios and examples of their work. For most writing roles, you can get a good feel by simply going through previous pieces they’ve written. 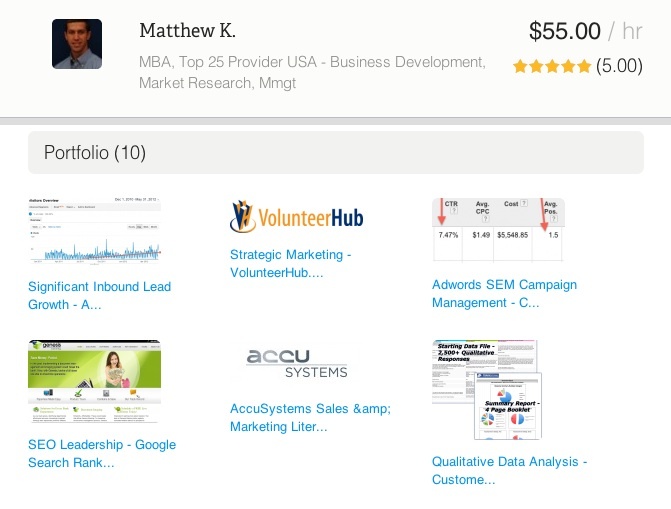 oDesk’s portfolio feature makes it easy to evaluate a contractor’s past work. Below is a screenshot of what my portfolio looks like. Each project can be clicked and reviewed individually, further streamlining the evaluation process. Applicant tracking systems: There are many cloud-based applicant tracking systems available. I’d recommend using an ATS when you begin recruiting across multiple virtual marketplaces. Zoho offers a free edition of its ATS, which seems to get the job done. My wife and I dated for several years before we decided to get married. When hiring online workers to your virtual content team, I believe you should do a little “dating” too. I’m not saying go to extremes here; I’m simply saying you should be cautious before you allow new writers into your “inner circle.” That’s one of the beautiful things about the virtual workforce: You don’t have to commit to a lot of up-front risk with new team members. To start the dating process, let your new writers prove they mean business by working on a test project. For example, offer a competitive fixed-price budget to your new writers. Let the finalists “compete” to see whose writing style is the best fit for your needs. Be sure to set clear expectations and deadlines on the test project. Overall, did the writer meet or exceed your expectations? 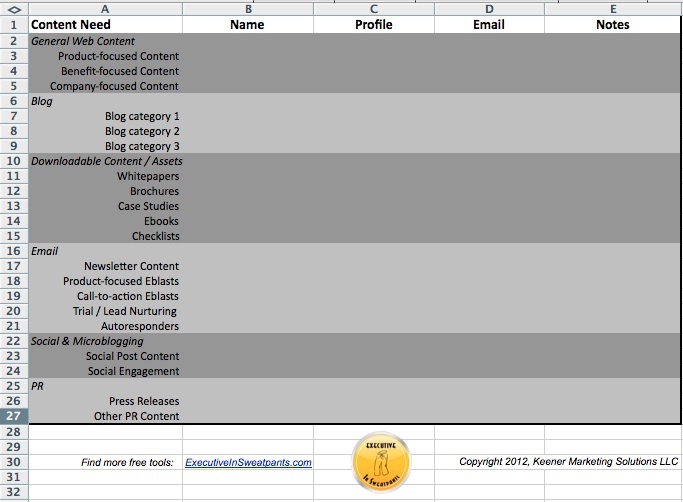 Can you realistically picture this writer creating content for one of your clients? Did the writer follow all requirements of the project (deadlines, content specs, etc.)? If you cannot answer yes to all of the previous questions, it may be a warning sign that this person isn’t a good fit for your team. The net result of the previous three secrets should culminate in a rock-solid virtual content team. Use your matrix (identified in Secret 1) as a living document. As team members leave or join your team, update the matrix to ensure no gaping holes exist. Continuously recruit using the secrets outlined in this article. Set clear delegation guidance: How will you delegate new writing assignments to your team? Are you going to use a project management tool like BaseCamp or FreedCamp? Or will you use something a bit more basic like Google Drive? Make sure your team knows how you will delegate to them to reduce confusion. Avoid billing and payment friction: Luckily, if you hire via Upwork, most billing issues are avoided thanks to its time tracking software. However, if you’re paying writers via PayPal or wire transfer, you’ll need to come up with a standard billing and invoicing system. Identify your “virtual liaison:” The virtual liaison is typically an in-house employee whose job is to help bridge the gap between in-house and outsourced workers. 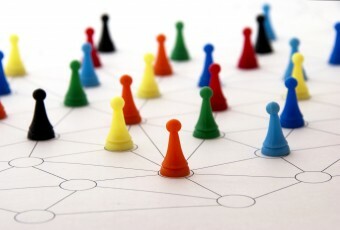 Most companies who have successfully implemented blended teams use a virtual liaison. Foster open communication: Communication will help you avoid a lot of issues that occur when managing virtual teams. Make sure you over-communicate and avoid sending contractors the wrong signals (even if you don’t mean to). Your clients have a growing demand for excellent content. How will you choose to accommodate their requests? The virtual workforce stands ready to support your needs. Take the first step toward building your virtual content team and achieving scalable growth. You’ll thank me later. For more tips on putting an effective content marketing team together, read “Managing Content Marketing” by Robert Rose and Joe Pulizzi.